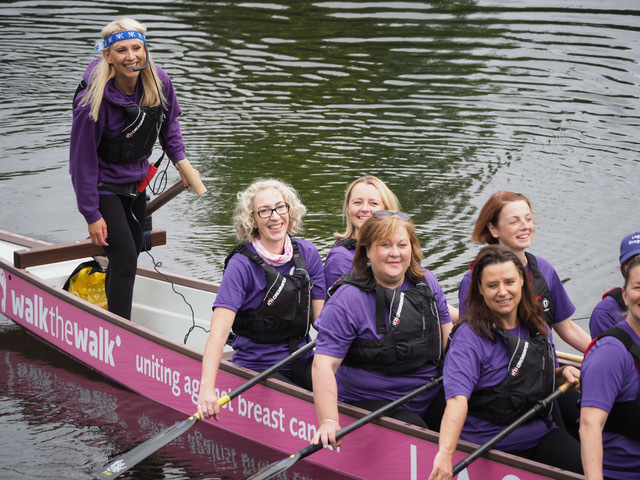 Lagan Dragons is Northern Ireland’s first ever breast cancer survivor Dragon Boat team, formed in September 2015, with training sessions from Belfast Boat Club, 12 Lockview Road, Belfast. Our team is open and inclusive to all, however, we are primarily made up of breast cancer survivors but we welcome new members of all ages, backgrounds and abilities! Our club Captain and founding member is Joanne Rock, a fully qualified Irish Dragon Boat Association (IDBA) Helm and Coach. Joanne successfully led the team (who finished 47th out of 128 teams from around the world) to the 2018 International Breast Cancer Paddlers’ Commission (IBCPC) Participatory Dragon Boat Festival in Florence, Italy. She has also represented Team Ireland at the 2014 IBCPC Festival in Sarasota, USA. Lagan Dragons have several fully qualified IDBA Helms/Coaches and our head coach ‘Gino’ is a former K1 world champion. Our mission is to provide opportunities for those affected directly or indirectly by breast cancer to participate in Dragon Boat paddling, which in turn helps support and develop their emotional wellbeing while achieving overall improved general health and fitness. To facilitate this, we aim to grow our club membership year on year, make new friends and continue to improve overall fitness while having fun at the same time! to celebrate our lives and have FUN! to laugh and celebrate our lives every day! These one-hour sessions run from March to November, and during the winter months, we continue our fitness regime with dry land training. Our training caters for all levels of fitness and competence – we strive to improve everyone’s overall fitness and, while there is a competitive element to our training, everyone is encouraged to join in and train to their own level and abilities.